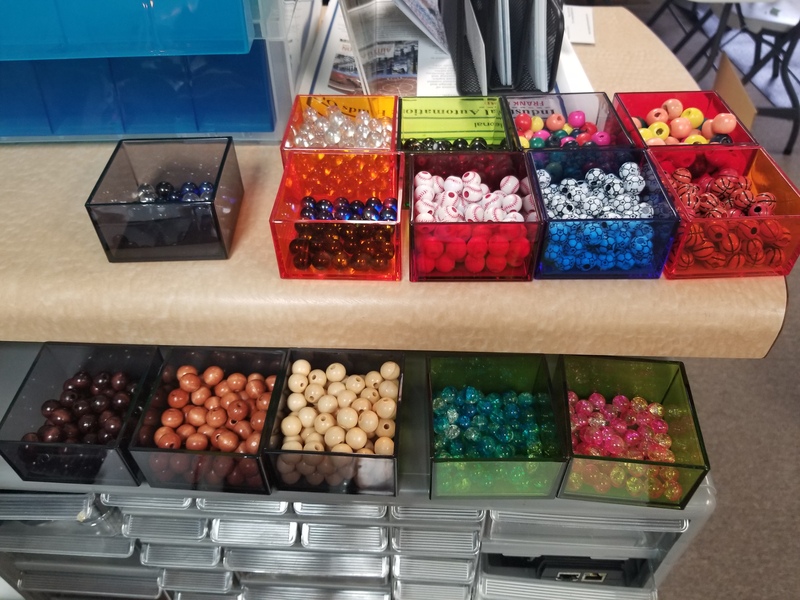 This post is both an update on the status of “My Little Factory” and an article on some new fun trainers that I am working on. As you can see in the above picture, all of the hardware for the machine side of the factory is pretty much done. Everything is operable in Manual Mode and mostly there in Auto. 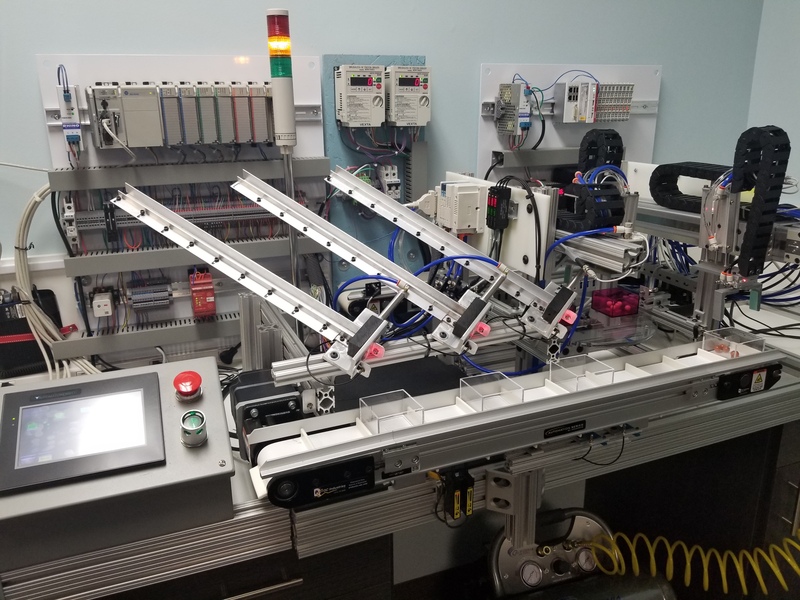 The infeed conveyor indexes, escapements work (though sometimes the balls bounce out of the boxes…), the dial rotates, and both pick and places operate correctly. All wiring and pneumatic plumbing is complete, and the system runs in “semi-Automatic”. This is a layout of the operation of the system. A box is placed in the first pocket of the indexing conveyor and the “cycle” button is pressed on the HMI. As boxes make their way down the conveyor, balls are dropped into them at stations 2, 4 and 6 from the escapements, based on the selected recipe. The filled box is picked up at station 10 and placed on the dial table. They are inspected at station 13, where the results are compared to the recipe for ball color and number. 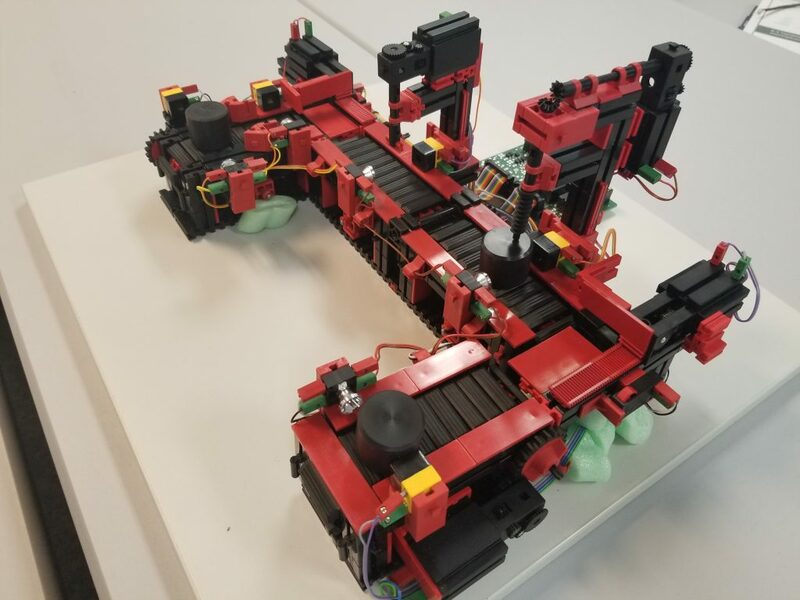 The box is then picked from station 14 and placed on the outfeed conveyor, where boxes can be moved either left or right based on the inspection results. As you can see, the escapements can be loaded with balls of a lot of different colors and materials. I have done some preliminary machine vision work with my Keyence camera system, and some of the balls can be quite challenging to differentiate. I have also purchased a Cognex color camera and will probably use that in the actual application. So what is the idea behind this training machine? There are a lot of different techniques that can be taught. The program has been completely written, but there is still some debug left to do. The most complex part of the program is the recipe management and part tracking. This will be for very advanced students only. This is all nearly ready using the Allen-Bradley ControlLogix/CompactLogix platform. Siemens will be next, the hardware is already there (S7-300) but the program needs to be written. I have also made some progress on the process control side as shown above. The load cells for weighing the tanks have been wired and are ready to be tested. I now have a good idea of how I plan to wire the pumps and valves, but the interconnect manifold and its associated sensors are the next big challenge. I will be using the Siemens controller to start with. 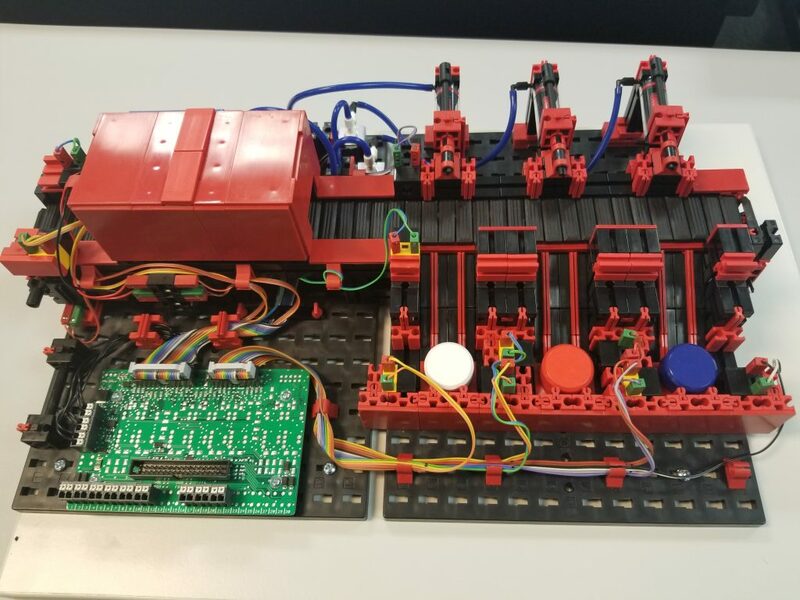 This is a conveyor with color sensor and several bins to eject different colored pucks into. The sensor is analog 0-10v, there is actually a tiny compressor to actuate the pushers. I would call most of the programming associated with this “Intermediate” level. 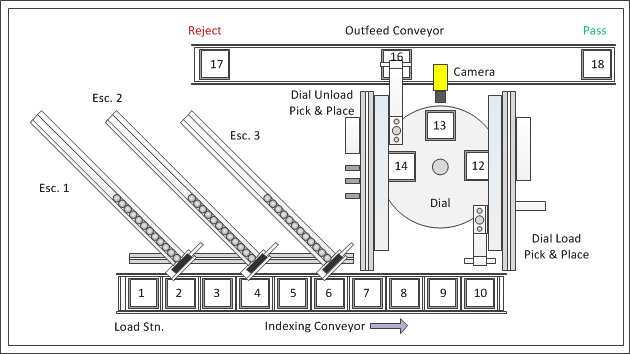 This is a series of conveyors and motor-driven actuators. Again I would consider this to be intermediate level programming. I’m not exactly sure what the small machining center and drill are actually supposed to do other than turn, but it should be fun. This bad boy is an X-Y-Z application to store and retrieve items from 9 different locations. I would consider this to be an advanced topic, especially when linked with the part tracking and recipe topics I mentioned previously. 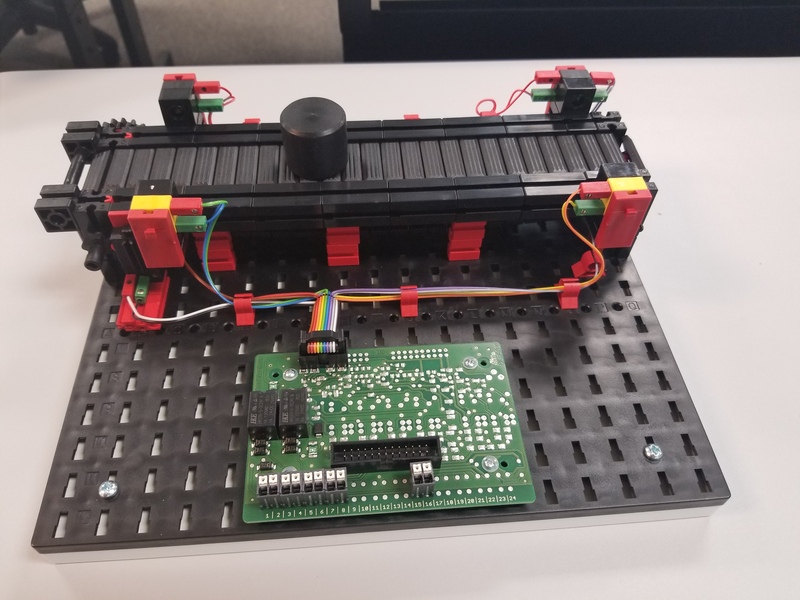 This little conveyor will need to have some technique added to it to be useful, but it also shows the interface board that is common to all of these “toys”. I also bought an obsolete system that I will probably use for spare parts as much as anything. It is all 9 volt stuff, so it will be harder to use the parts than the more typical 24v that everything else runs on. There is quite a bit that needs to be done before this can be used or made into marketable trainers. 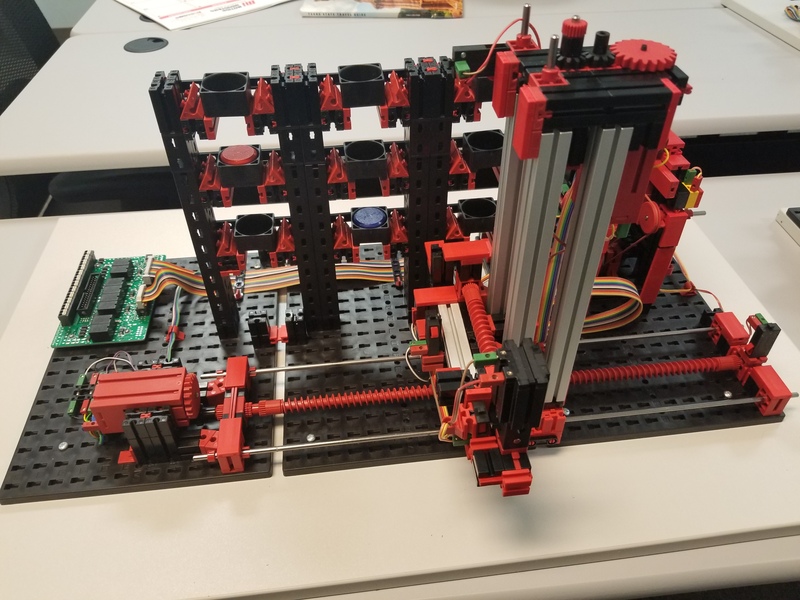 I need to be able to plug different trainer PLCs into it, I’m hoping to use AB CompactLogix and Micrologix, as well as Siemens S7-300 and S7-1200 platforms. I also want to incorporate an E-Stop, Power On/Reset, light stack indicators and maybe a small HMI as an option. I may use remote Ethernet/IP or Profi modules to interface with my equipment. Automation Direct or EZ Automation platforms would also be a possibility, but I would need to be convinced that there is a market for it. 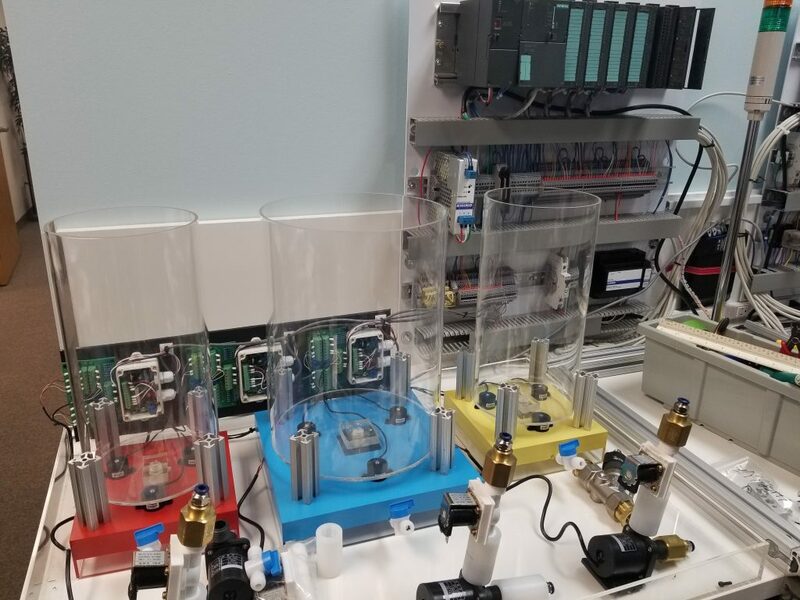 Another very useful interface would also be troubleshooting blocks where signals can be disconnected/cross-connected so that technicians can use a meter and their new PLC training to troubleshoot. This is something that a lot of my students have requested. Anyway, this is where I’m currently at in my venture. It’s hard to make quick progress on all of these ideas since I’m still spending a lot of my time traveling and teaching, but I feel like its all getting there. Hopefully some of my partners in training will be able to help me with some of this. I am always looking for new partnerships in some of these ideas also, hit me up if you want to be involved.